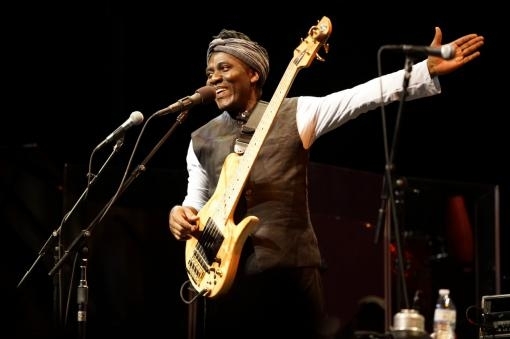 The Cameroonian musician Richard Bona is returning to Brno after a year and a half. While last year the audience in the Janáček Theatre had their breath taken away by his Afro-Cuban project Heritage, this time he is coming with his international group Richard Bona Group. When on 25 November in the Sono Centre we are admiring Bono’s virtuoso guitar playing, it would be good to be aware while he may have inherited his sense of rhythm and general relationship to music from his ancestors, his current level is the result of his hard work. At least this was something he emphasised in our interview, in which we also covered Bono’s love of flamenco and for his club, which he recently opened not far from Paris. Yes, as a little boy I first began to play on the balafon. Everyone at home plays on the balafon or percussion – it is a traditional instrument. It is part of Mandé cukture in the countries you named, as with the Bantu culture. It can have various forms and various names but people across Africa play the balafon and other rhythmic instruments. What role did your early experience play in your further career? I don’t know what role it played in my career but playing the balafon played an important role in my musical development. Whenever later I took any instrument into my hands I always drew on the experience I gained earlier. The balafon represents my musical roots. When I play on the guitar, it sounds a little like a balafon. When I play the bass, the influence of the balafon can be heard a little. We Europeans often admire the complex rhythms in African music. How do you work with this phenomenon? Rhythms in African music aren’t complicated, even if people often think so. I was born in Africa. When I was a toddler, my granddad used to play these rhythms and so did my mother. I have lived with them from birth and I don’t see them as complicated – it is natural for me. It’s like when you take a little child and teach them to fish. In twenty years he will be a great fisherman. Yes, of course. But there is one more important thing. What always helps most in music is your effort. You can play the balafon or the violin, but above all you have to work on yourself, you have to exercise regularly. Only if you specifically and regularly improve do you get the result. If you don’t work at it then it won’t help you. This is true for jazz, classical or traditional music. If you don’t practice regularly, then nothing will help you. When did you decide that you were going to be a professional musician? On a professional level? I have been a professional ever since my childhood. I always earned a living from playing music, never doing anything else. I played from the age of five and already then I was getting money for it. In fact I can’t remember it being otherwise. Truly form my earliest childhood music was my profession. You are doing well in the jazz world, playing African and Cuban music. Does there exist for you some kind of link that would connect all these genres for you? All of it is music that I love. Just now we are starting to work on a flamenco project in which I will work with the music of southern Spain. I see myself as an eternal music student. I savour those moments when I learn something new. For me there is only one kind of music and that is good music, that which affects my heart. If some kind of music affects my heart then I am happy to play it. How do you choose guests for your albums? For example John Legend and Susheela Raman sang on your album Tiki from 2006. Chance plays a role here. Of course I pick characters who play or sing well and whose music appeals to me. Sometimes I write a piece and immediately I an idea as to who might interpret it for me, which singer or guitarist it would suit. It always has to have some kind of logic. For example I would not invite Stevie Wonder to take part in a flamenco project. Have any of your guests on your albums surprised you? A moment ago you mentioned John Legend. I wanted to send him the piece in advance but he didn’t want it. He claimed he didn’t want to hear it beforehand and that he would come straight to the studio and write the text on the spot. It seemed a bit hit and miss to me because it takes some for me to write good lyrics. Yes, I can also come to the studio and immediately play a new song, but not write the lyrics. And he came and he really did think up the text in the space of a moment. So yes, that was a surprise for me. And a good one. On your albums you sing in French and also in Duala. Do you choose the language according to the theme or otherwise? In music I don’t calculate. From the start of my career I tried to sing in my native language, to show my roots. But I am not planning on singing in African languages in the future. They are languages which not even Africans speak any more. Why defend cultural heritage if people aren’t interested? Today in Africa if you switch on the radio they are singing in the languages of the colonisers – French, English or Portuguese – but rarely in African languages. People are speaking these languages less and less. For that reason this year I decided myself that I will no longer sing in African languages. And wouldn’t it be better to fight against the trend you describe? But I wasn’t born to fight. I was born to live. What should I fight against? I want to live with other people in peace – I want to share with them. We have to accept certain realities that exist and come to terms with them. 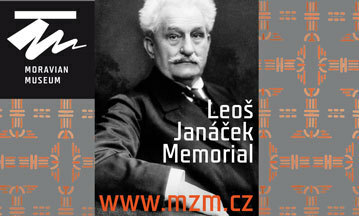 Last year here in Brno you appeared with the group Mandekan Cubano and the album Heritage. What is it specifically in Cuban music that inspires you? Cuban music has its roots in Africa. What do we call Cuban music today? It is a blend of music from Africa, Europe and even Asia, and of course of the original inhabitants of the Caribbean. These islands were already occupied when the Europeans arrived. In their music all these components are mixed together. Among other things the instruments used tell us a lot. In the traditional Cuban orchestra you can find the trumpet, originally a European military instrument. The piano also has its origins in Europe. The maracas are originally an Indian instrument while the conga and bongo were brought with them by African slaves. The label “Cuban music” is thus a simplification. We have to look at it more closely and then we can see how sophisticated it is. For that reason as well I called my project Heritage, because it is about the heritage of various cultures, about world heritage. The period of colonisation was difficult, but even in those tough times people played music and left it to us as our heritage. You wrote most of the pieces on the album Heritage yourself, but you also chose one composition by Guillermo Rodriguez Fiffe. Why specifically by him? I am used to working with emotions and I associate this composition with a concrete experience. When I first came to Cuba I went to one club to play in a jam session. And the first piece that I played there was this one. Already then I decided that one day I would record an album with Afro-Cuban music, and Bilongo had to be on it. Fifteen years later I have fulfilled that promise. You have already mentioned that you will be working on a flamenco album. Can you tell us something more about it? I am going to be meeting the musicians I will be working with for the first time tomorrow. I will be going for it to the airport. I can’t talk about the album yet as we haven’t had even one rehearsal. I love flamenco; I’ve been in Seville and in Jerez de la Frontera, where I prepared for this project. Once we have had at least a week’s intensive rehearsals with the band I will be able to say more. At the moment I don’t know the details but I believe it will be a good project. I have several of my compositions prepared, and there will also be some adapted works. First we will have to rehearse everything, come up with arrangements and find out how the group will work. Yes, music is played there every week from Thursday to Sunday. It works pretty much like my other club that I have in New York. I have already been completely independent as an artist for several years. I produce my albums myself, recording them in my home studio and I do not need a record company. I sell my albums myself after the concerts. And I set up these two clubs for this reason. Often artists in clubs in New York do not have good conditions. And even I did not want to be treated badly by club owners. One day I was complaining about this and Quincy Jones said to me: “Instead of complaining don’t you want to set up your own club?” It was clear that if I didn’t want to accept bad conditions I would have to set up my own business which would be fully under my control. I run my clubs in such a way that I would be satisfied with it myself. I feel much better being independent than if I were represented by a record company or an agency. Last year in Brno you played with the group Mandekan Cubano, now you are coming with the Richard Bona Group. What will we hear? There will be something from the album Heritage, and something from older albums. I’ve recorded eight discs and I think there will be something from each of them. Our current tour begins in China, we will play in Singapore and in other Asian countries and then we will move on to you to Europe.